At the entrance to Bowers Rock State Park, one of the signs mentions surveillance. So exactly how big is Bowers Rock State Park, the natural wonderland near Albany I wrote about last week? And is there really camera surveillance of people who go in and out? But Scott Youngblood, park ranger for the Willamette River Greenway, promised to dig out the correct number. He did, and this morning he sent word. Bowers Rock contains 568 acres. Another thing I had wondered about: At the entrance, past the end of Bryant Way, there are a bunch of signs. One of them lets people now they are “under surveillance.” On a past visit, and again last week, I could not spot a camera. But Youngblood says that indeed, a camera is there whether I can see it or not. And it lets him know in real time who comes and goes past the entrance. It also gives him a count. In July, he told me, the camera recorded about 90 people. Almost all of them, he says, carried fishing poles. But what exactly does Bowers Rock deserve? Did MS Steele give a wink and a nod on Bowers? Has the skinflint State Legislature green lighted the Bowers Rock upgrade? And what has our local State representation been doing to give Bowers Rock the place in the State Park system that it deserves? Lastly, it must be asked … Doesn’t the very nature of a linear universe imply that some State Park must be the last? If so, then Last is not an embarrassment. Rather, it is just another subjective judgement. I’ve always gotten the impression that the people who live near Bowers Rock like having their own private state park at the expense of other taxpayers who don’t know about it or can’t easily access it. Here’s hoping Steele really does make it a true state park, one everyone can use. As somebody who lived for 40+ years at the entrance to the proposed park, I can tell you that none of the residents used it as the state let the rock roads disintegrate (5th Avenue Sand & Gravel operated out of there from before the 60’s to the 80’s and then the county let another rock outfit in that was very unfriendly to visitors. The property is a poor excuse for a park as it is farmland which floods. Kudos to Hasso Hering. Links to his on-line production is featured quite regularly on the LOCAL tab of Google News. More often than Democrat-Herald. More often than Gazette-Times. There are no public signs, only private property signs. Who maintains the gravel road to the park entrance. The hidden state park, enter at your own risk? If it’s a state park put up some signs and encourage the parks use, and have clear access. 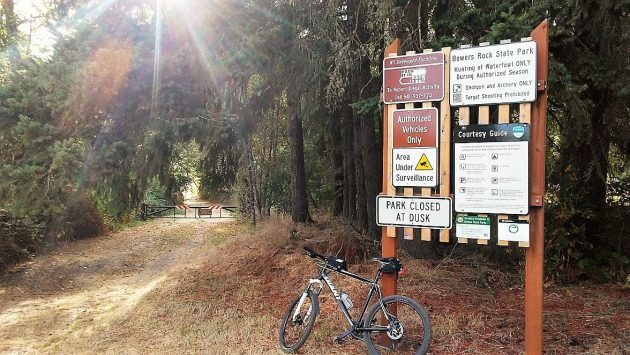 I agree, the private road signs and lack of any State Park sign, seems to be a smokescreen to discourage use of the park by the people who own it. In the Trump Era, Mr. Walter’s satirical suggestion, warning of entering the park “… at your own risk” seems perfectly transactional, at least until the mid-terms. As to Mr. Walter’s “smokescreen,” there is none. State Parks has no intention of doing anything more than has been done in the past. Past is prologue. All I am saying is a state park without reasonable public access shouldn’t be a state park. The folks in that area have a private park and so it shouldn’t be a state park. The state should secure access for tax payers to enjoy the park or sell the park for the public benefit. “How big it as”. What does that mean? It means I committed a typo in a headline and didn’t catch it. I’d love to be part of making this park viable. Would advocacy need to happen on the local level, state level, or both? Last year I worked with a hay outfit that worked these fields for stumpage. It is an astonishing location and I think it would make a great site for a festival.